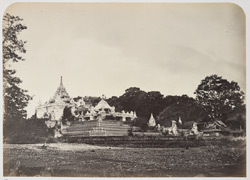 Photograph of the Mingun Pagoda at Mingun, Burma (Myanmar), taken by J. Jackson in 1868, part of an album of 43 views of Burma from the Sladen Collection. The pagoda stands on the west bank of the Irrawaddy (Ayeyarwady) River at Mingun, near Mandalay in central Burma. It was conceived by King Bodawpaya (ruled 1781-1819), who built the new capital city of Amarapura and conquered Rakhine (Rakhaing). If completed it would have been the biggest pagoda in Burma and as it stands is thought to have the largest brick base in the world. Construction was however abandoned after his death in 1819 and it was left unfinished and later damaged by an earthquake in 1838. This is a general view from the riverside of the east face of the pagoda, shown in a semi-ruined state, with two huge chinthes, the guardian figures of Burmese temples.